This game can be played entirely using a mouse or touchscreen. Drag players to move them OR press the top button to initiate a player specific action. If you don't want to make any more moves, press the bottom button to end your turn early. 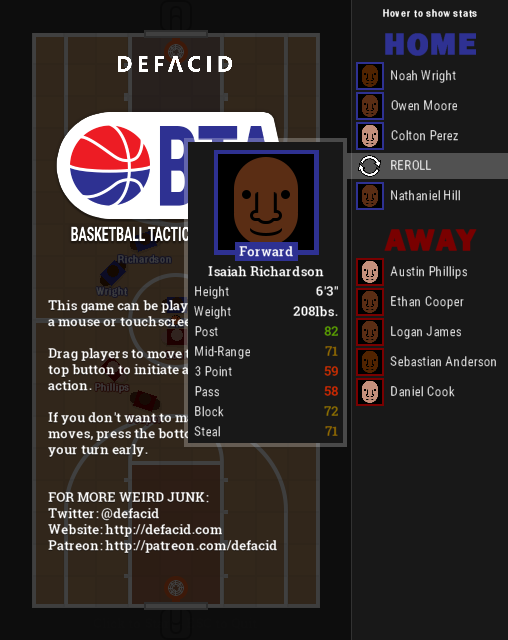 On the main menu you can highlight players' names to view their stats and click REROLL to "draft" a new player. You can push your luck and try to get a player with better stats once per slot. During each team's turn, that team's players can either be dragged and dropped to move or take an action by pressing the top button in the bottom right hand corner. 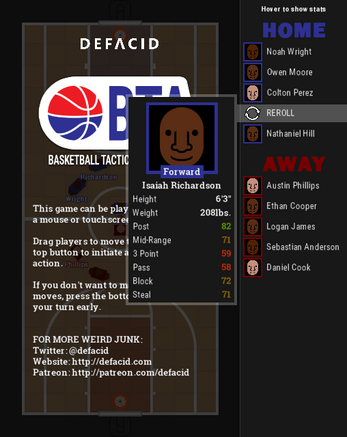 Once pressed, or moved, the button will allow the action to be undone as long as the player hasn't been deselected. Passes and shots are permanent once completed. Turns end automatically if all players have exhausted their actions but you can end a turn immediately by pressing END TURN. 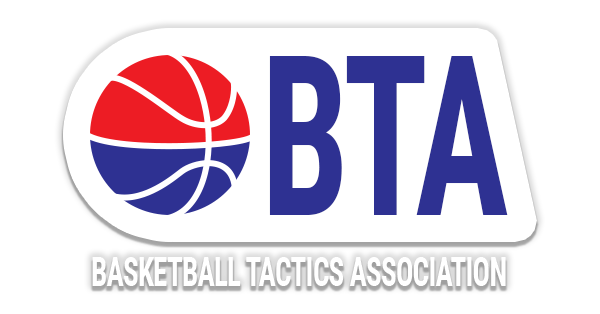 A standard BTA game is played between two people, using the same device, who will assume the role of a "coach" that sets the plays turn by turn. Every player on the court can take one action each turn, with the ball handling team going first. Tactics can vary from person to person, and depending on the stats of the rolled teams, but all of the available actions are very simple. Turnovers are the result of player error and will initiate a throw-in by the opposing team. A player stepping out of bounds, the ball going out of bounds, the shot clock reaching zero, or the turn ending before the ball is thrown-in will trigger a turnover and give the opposing team possession. Making sure you're on the court, making good passes, and only taking good shots will minimize your turnovers. One important thing to note: Unlike IRL basketball, throw-ins ALWAYS start on the far end of the court on the opposite side of the offensive team's goal. Why would anyone ever make this? Because it's awesome, weird, and I THOUGHT nobody else would ever try to do something so obviously insane... but I've met exactly one person doing something like this on twitter (@KJEveryday) so apparently other crazy people like me exist. I didn't even play the game but I chuckled at the idea of it. Is there anyway to compensate you for the enjoyment you've bestowed upon me? If you look down below, there's actually a button that allows you to pay for this game, instead of downloading it for free, but you can also become a Patron and get updates to any new weird/free/open source games that I make AND following me on twitter is always free! Can I play this single player? Absolutely! You could absolutely control both teams and play against yourself! I'd venture to say that it would probably be more fun if you shared this once in a lifetime experience with someone you love, or at least mildly tolerate, though. Do you need help working on this game? I actually am terribad at making sound effects, so you MIGHT notice that this game has absolutely no sound! 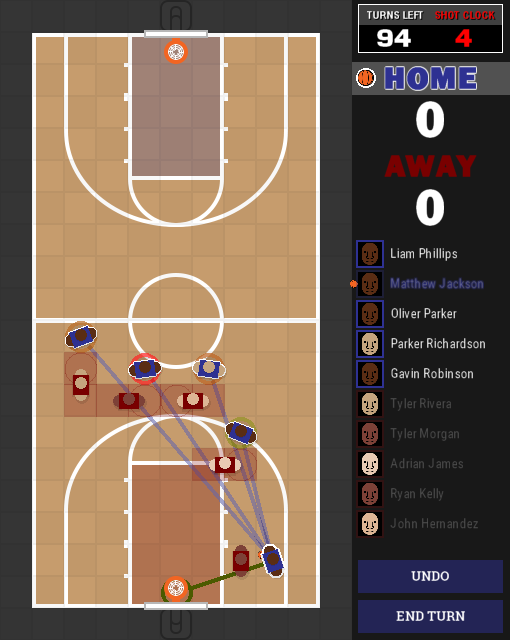 The average basketball game has a SLIGHTLY more distinct audio signature and if you think you could make some awesome sound effects for this, I wouldn't be mad at some help! Also: Feel free to learn from, and make fun of, the source code on Github and to submit bug tips there too!